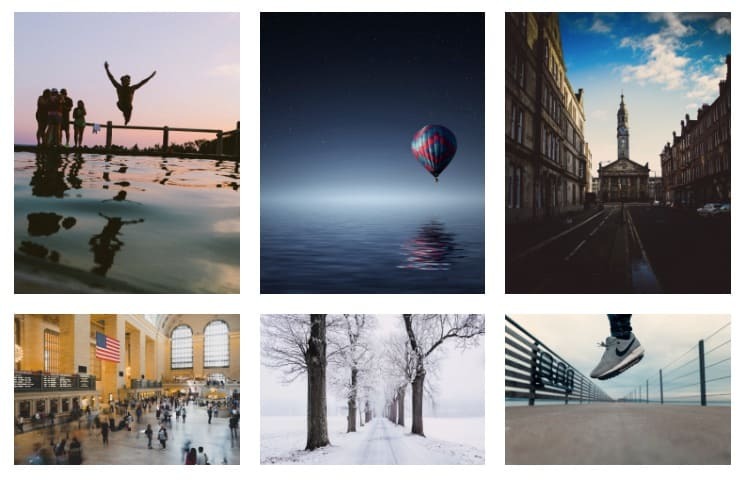 Share a group of images on your site in a gallery-style format. The gallery block is very similar to how image galleries worked in the classic WordPress editor. There are a few additional options in the new Gutenberg gallery block. Let's go over them now. Once you've selected all your images, you'll click the Create new gallery button to insert the gallery onto the page. That's where the rest of Gutenberg's options come into play. Captions are completely optional, but each image can have its own caption. The caption will typically appear at the bottom of each image, in white text with a semi-transparent black background. However, each theme can choose to style image captions differently. Gutenberg image galleries can be displayed in almost an infinite amount of columns, however, I recommend no more than about 6. After that, your images will appear very small. Use the columns slider in the right sidebar to adjust your columns. If you're using images with different aspect ratios (i.e. landscape & portrait), you'll likely want to keep the Crop Images setting on. Crop images will ensure that your photos fit nicely within the number of columns you have selected. I'll show you what I mean below. Crop images will automatically make adjustments to your images to ensure they fit perfectly into the number of columns you have selected. You might lose part of your image, but your gallery will be displayed more beautifully. It's a bit of a tradeoff. Attachment page: Links to a specific page on your site, dedicated to displaying information about the image. This is rarely used. The only block you can convert a gallery to is the image block. Doing so will take each image in your gallery and turn it into its own image block.